Demco’s interior design team designs hundreds of educational spaces each year. The inspirational spaces we create in response to our customers’ needs and goals encapsulate many of today’s contemporary design trends. 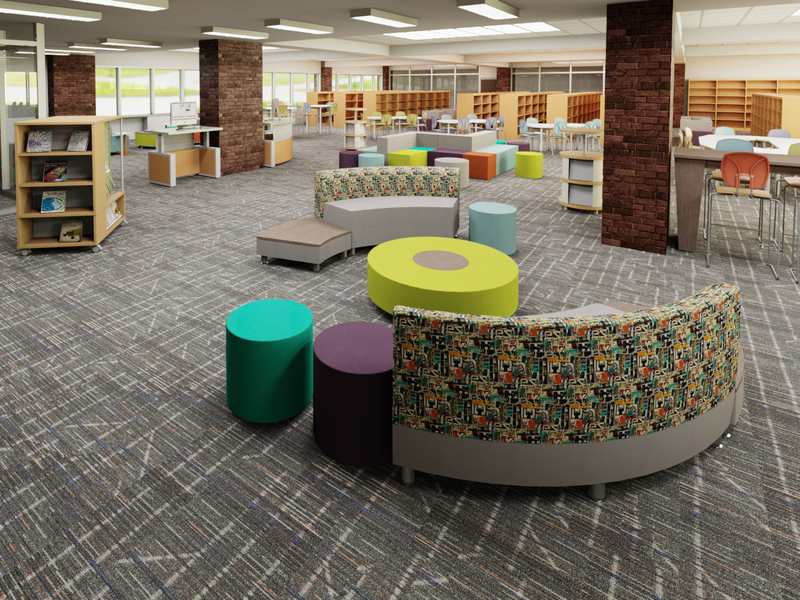 Below, we share the top five trends our design team considers when creating a learning environment within a school or library. Mobility and flexibility are critical when designing today’s educational spaces. 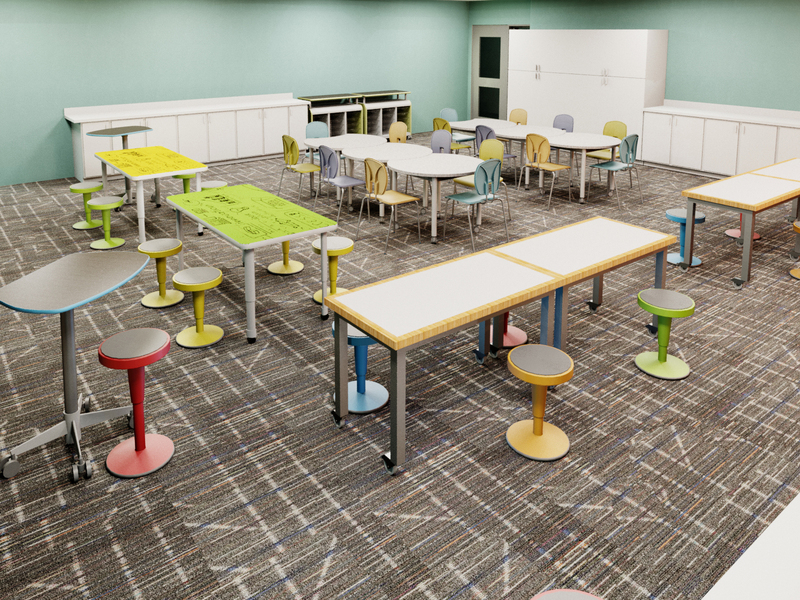 Spatial designs that are flexible help support collaboration and creativity while providing educators and students with the ability to reconfigure their space to support different learning styles, group sizes and project needs. The examples below illustrate learning environment design with a focus on flexibility and mobility. This high school learning commons includes a large, flexible area that is used for many different purposes: independent study, large-group study, staff meetings, school events, projects and even community events. Mobile tables can be reconfigured to suit different group sizes. The fold-and-nest functionality of the tables combined with stackable chairs creates maximum flexibility for this learning environment. 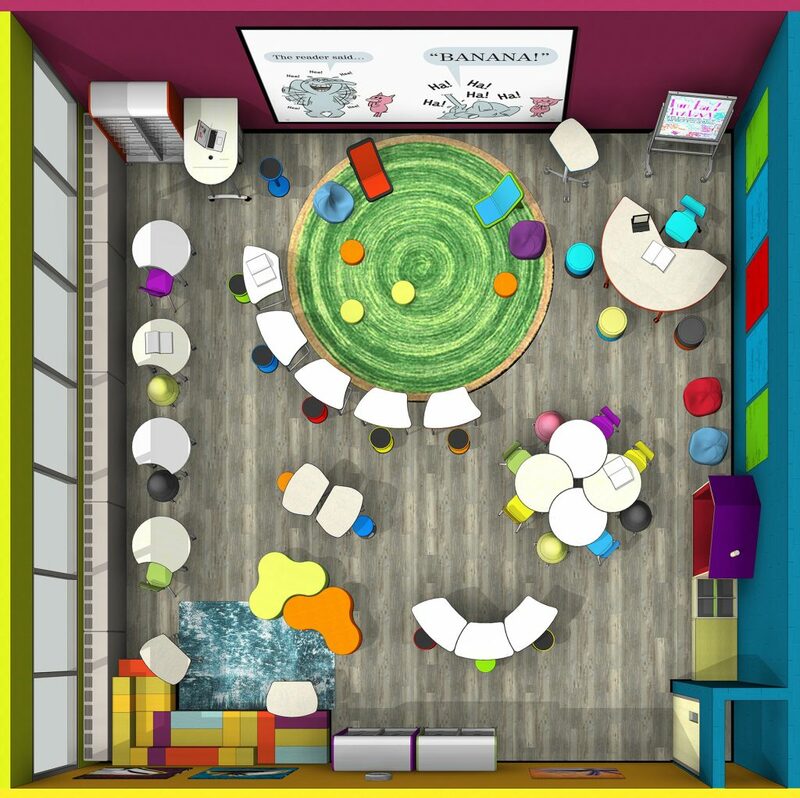 This classroom was designed to meet our customer’s goals of supporting 30+ students in an environment that encourages group learning, individual study, testing and open-format collaboration. 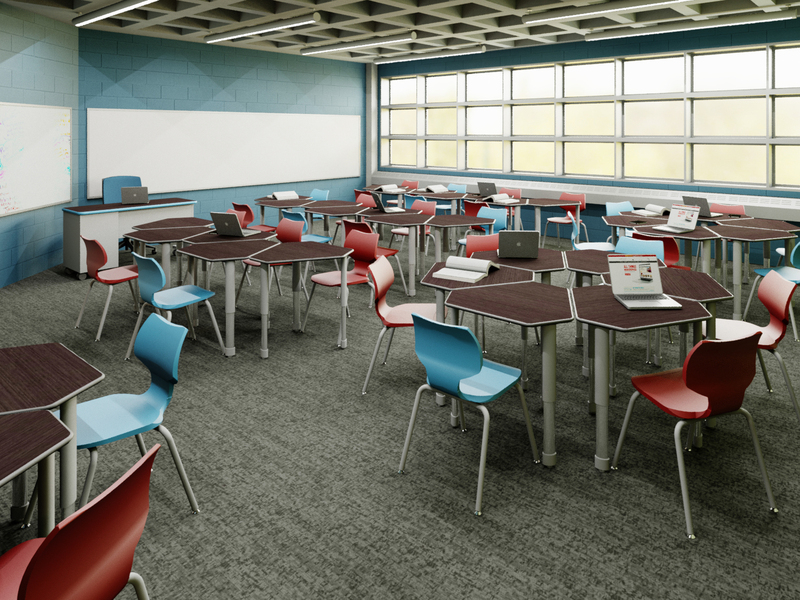 Flexible classroom furniture allows for easy reconfiguration, which enables educators and students to take control of their learning process and reduces transition time from one activity to another. Explore this learning environment in 360° virtual reality. 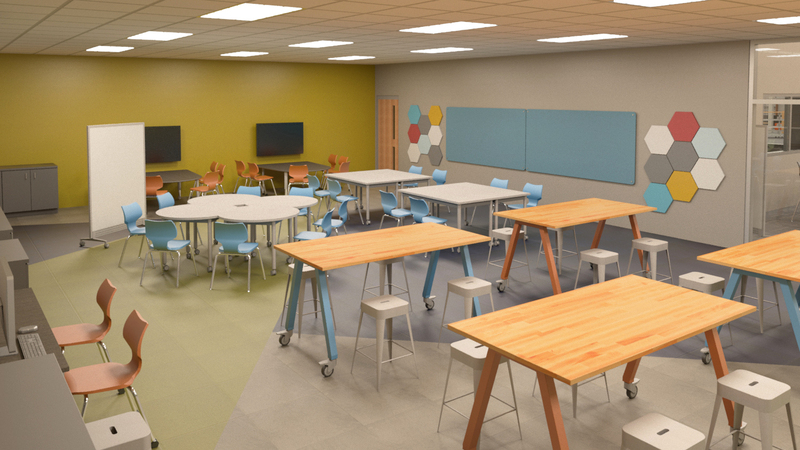 Need Help Reimagining Your Learning Space? As designers, we consider the size and goals of a learning environment, and zoning is an inherent part of that creative process. Zoning helps the overall interior function in a variety of ways while supporting different modes of learning and working. For example, zoning can help separate collaborative group work, which may be noisy, from more focused and quieter work environments. Zoning can also help provide different aesthetic experiences within a space. It’s critical to consider how the zones work together within the overall space while each retains a unique and defined identity. 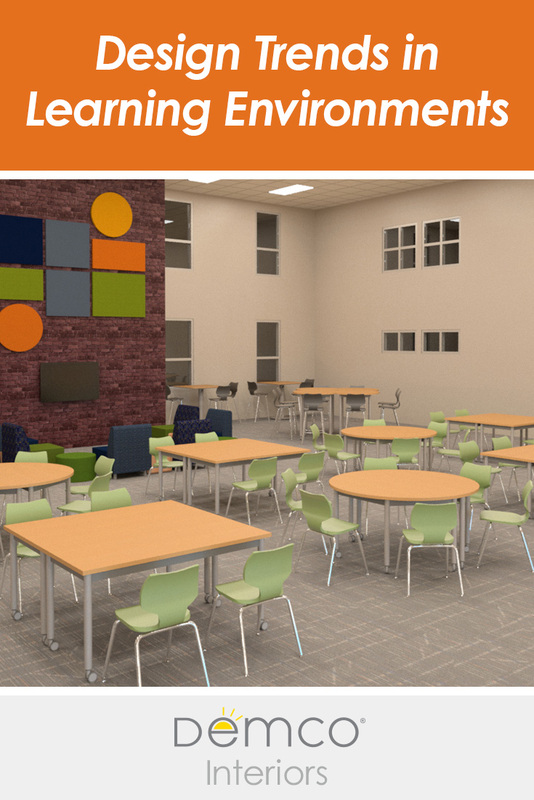 The examples below feature clearly defined zones within a larger learning space. More often than not, an elementary library needs to serve many functions. This space has a defined classroom area, a rug area for younger classes, designated maker tables and mobile shelving throughout. The curved shelving is designed to create two distinct reading nooks within the space. Combined, these elements achieve a naturally zoned interior that supports the overall goals of the school. Large spaces can be broken down into smaller and more functional working zones by using a combination of furniture types. Creating natural groupings that flow together helps utilize all areas of an interior. This learning environment uses unique and playful lounge and display pieces that combine to create a vibrant landscape. Explore this learning environment in 360° virtual reality. A learning environment that is designed to offer choices can help students maintain focus and engagement throughout the day, and more choice and variety means the space will be used more frequently, for longer durations and in different ways. Products that provide ergonomic, aesthetic and functional choices can also help make a space more playful and add character. The examples below illustrate spaces designed to offer students multiple choices in seating and work spaces. Student surveys at this high school highlighted the need for modular lounge seating to support informal working styles and collaboration. 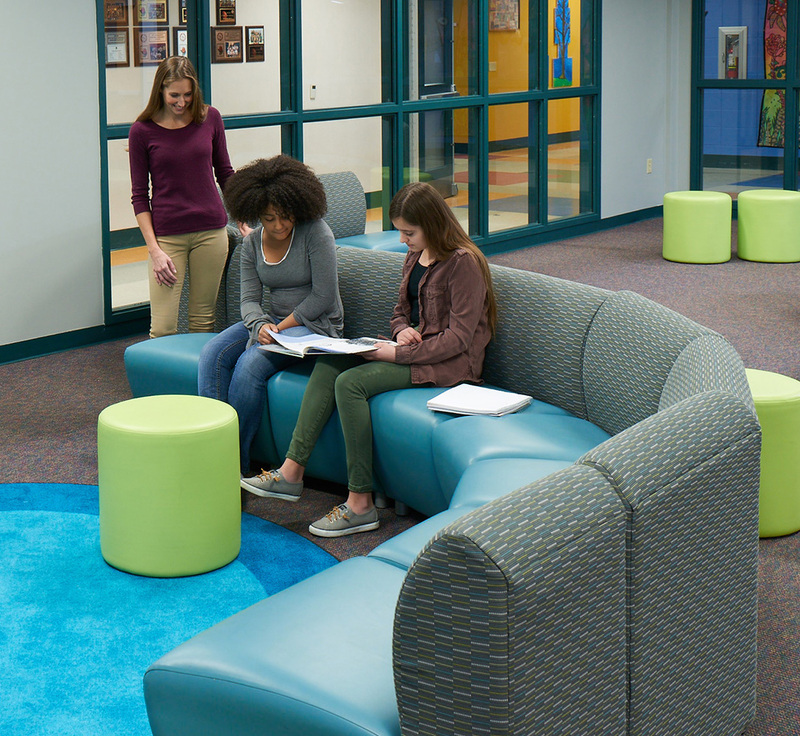 The wide variety of furniture we integrated into the space gives students independence in choosing what is comfortable for them and what best suits their needs. 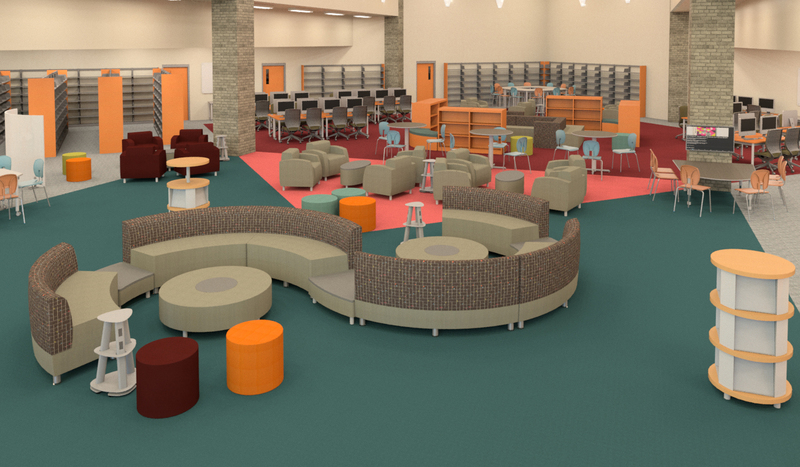 There are options for individual, small-group and large-group study and a playful mix of lounge seating, booth seating and tables to support those varied user needs. 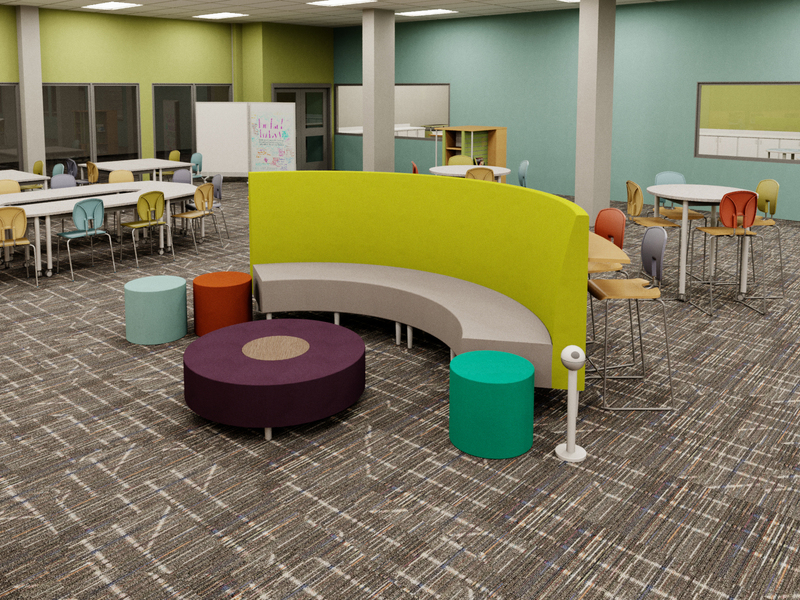 This interior was designed to include a variety of seating and work spaces that give students the authority to make their own choices and put them in control of their learning experience. 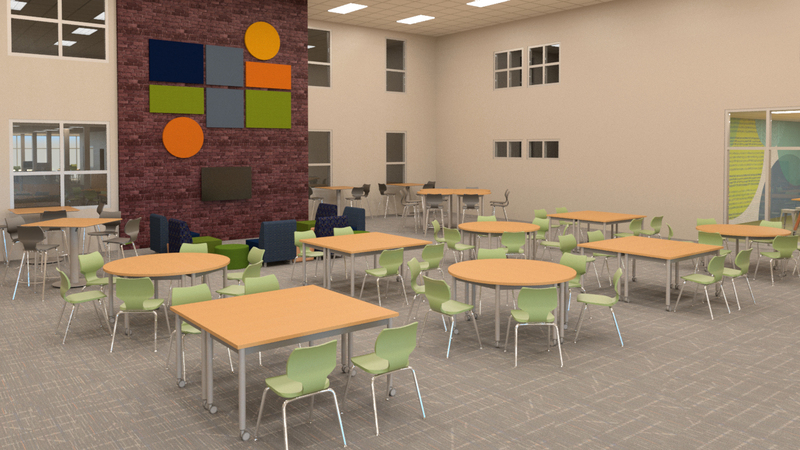 This space supports small-group media sharing and features a dedicated makerspace zone along with reconfigurable, collaborative tables. Makerspaces are becoming an integral part of many educational spaces. 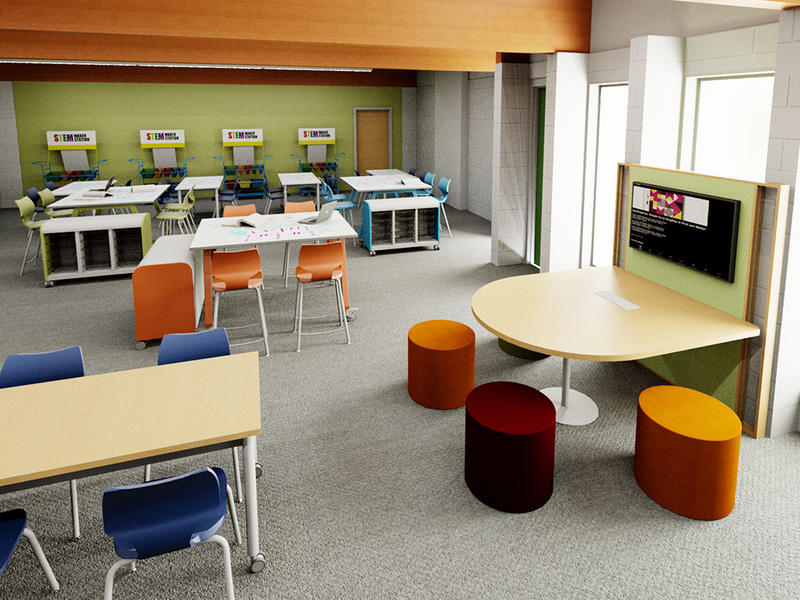 These robust environments are unique learning spaces that often define their own zone and feature flexible furniture and plenty of storage. The photos below illustrate two examples of makerspaces designed to offer ample opportunities for a variety of hands-on learning experiences. This high school made a big change by combining two existing classrooms to create a brand-new makerspace learning environment. A new entrance was added to connect the makerspace directly to the library. The school planned to use this space for many different types of activities, so we planned the furniture in the space to allow for flexibility, durability, collaboration and incorporation of technology. Butcher block tops, casters for mobility, flip-and-nest functionality and mobile storage components combine to support this contemporary making environment. As a learning environment incorporates more hands-on learning, the furniture needs to change to help facilitate these updates. Makerspaces play a key role in this forward-thinking educational style. 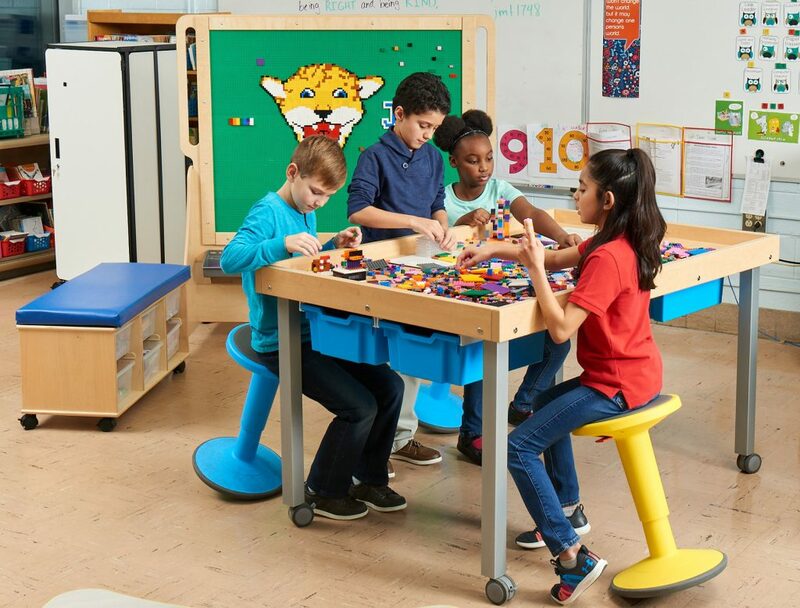 Height-adjustable stools, sit-to-stand tables, write-on tables and maker tables with reversible tops combine to form a colorful working environment and help to accommodate varying age groups and working styles. Explore this learning environment in 360° virtual reality. Color and texture within educational interiors add vibrancy, warmth and aesthetic cohesion. Lighter wood tones, such as natural maples and oaks, are becoming more common, as are bolder color palettes. Small color accents on furniture, such as table edges, can be used to help define zones. Larger splashes of color and bolder patterns, such as on lounge furniture, can be used to carry color throughout an interior. School colors remain a popular starting point when developing color palettes. Demco’s design team often uses them as a starting point and then develops the color palette further to best suit the nature and aesthetic goals of each space. See the photos below for examples of how color and texture can define the feel of a learning environment. 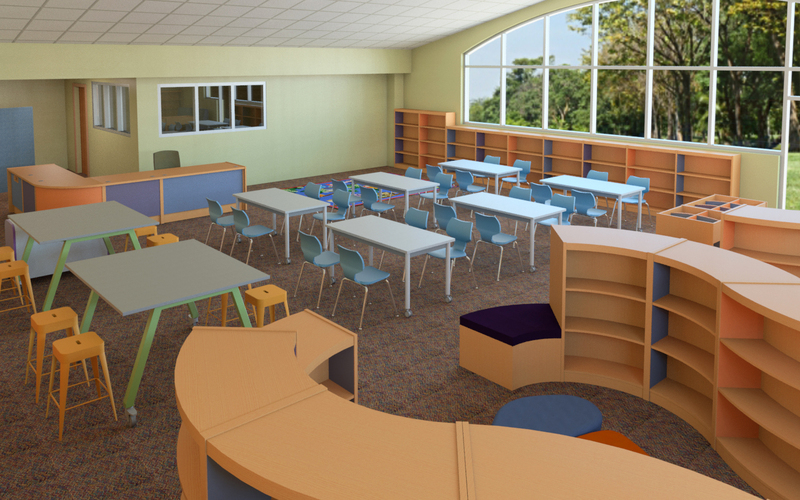 This elementary library had the goal of bringing a color palette into the space that would be calming to the students as well as reflect the organic tones of the natural environment outside. The Demco design team used a muted color palette with lighter-tone colors to achieve this. The blues and greens are soothing and complement the natural maple wood tone. How color flows within a learning environment can influence how that space is used. Color can draw students in and help engage them by setting the overall tone of the environment. Color can also energize or create calm by how it is composed within an interior. For this space, the accent colors on the walls are carried further into the room through upholstery fabrics and chair back colors. These splashes of color are offset with light maple accents. Explore this learning environment in 360° virtual reality. 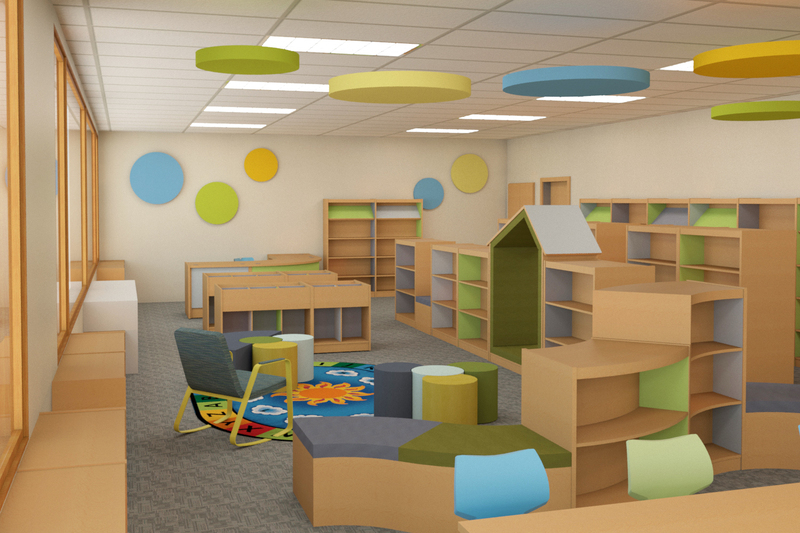 We are planning to remodel and renovate our 19′ x 31′ children’s area. We have a small budget that would include a new seating area and are interested in Demco’s durable, affordable furniture. I would love to consult with Amber or Angela about design ideas. Thanks for your interest. I’ll have a consultant contact you shortly.